Preferred Stock Investing, Third Edition, is now available at Amazon.com for $17.15, the best price ever for the paperback edition of the book. And Preferred Stock Investing also qualifies for Amazon's great free shipping program. The book normally sells for $19.95 so Amazon is really making you a great deal here (see Preferred Stock Investing at Amazon.com). Also on the book's Amazon page you can use Amazon's Look Inside feature to look through the book itself before you buy! Reader reviews are also available. See why Preferred Stock Investing is one of the highest reader-rated books that Amazon carries (Preferred Stock Investing sells within the top 2 percent of all U.S. book titles, out of about 5 million!). And remember that by following the instructions on page 1 of chapter 15 readers of the book are entitled to free periodic updates as long as the third edition of Preferred Stock Investing remains in print. There are two things about large institutional investors (think pension funds) that, under the right conditions, can deliver a specific opportunity to individual preferred stock investors - (1) they hold huge positions in high quality preferred stocks and (2) they move very slowly when changing those positions. What that means for us is that we have the advantage when market conditions change quickly as they have over the last two months. Preferred stock market prices recovered to their pre-crisis levels in August 2010 and have been very stable since then. But beginning in February the average market price of high quality preferred stocks started heading up in a big way, jumping to $25.72 by the end of March (see Figure 1). Large institutional investors have huge holdings in high quality preferred stocks. When buying or selling they have to move slowly, spreading their transactions out over several weeks, in order to avoid adversely affecting the market price that they are trying to take advantage of with their own trades. So when market prices are heading up, it is difficult for these investors to jump in quickly and lock in their buy orders. Using a technique called 'upgrading' (Preferred Stock Investing, page 195), preferred stock investors are able to trade in a low paying preferred stock for a higher payer at the same level of risk (as measured by Moody's) and have cash left over. Since the supply of U.S.-traded preferred stocks has remained flat (currently at 922 issues, up a net of 11 since January 1, 2011), the uptick in market prices can be attributed to an increase in demand. The market prices of many low payers have been elevated back into the land of respectability, back to a point where 'upgrading' becomes possible and we are starting to see opportunities to do so. Check your brokerage statement. If you own preferred stock shares with a relatively low coupon rate (less than 7 percent) that you've been hoping to unload, the tables are definitely turning your way. 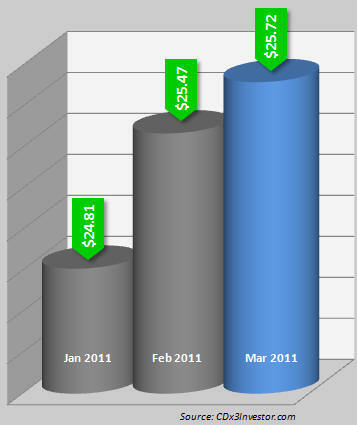 Figure 2 presents current data (closing March 30, 2011) for an upgrade opportunity identified by the Preferred Stock ListTM tool available to subscribers of the CDx3 Notification Service (my preferred stock email alert and research newsletter service). 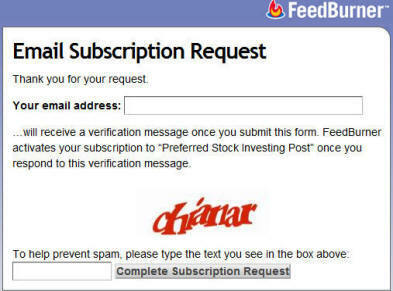 Note that in order to protect subscription values, trading symbols are not provided here. But this is real data as provided to subscriber's in the April 2011 issue of the subscriber's newsletter, CDx3 Research Notes. 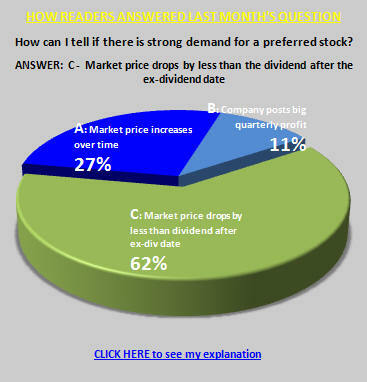 PFD-A pays a 6.7% dividend and is selling for a market price of $24.49. PFD-B, on the other hand, has a dividend rate of 7.0%; that's 0.30% higher than PFD-A. Now look at PFD-B's market price: $24.35. Even though PFD-A pays a lower dividend rate (6.7%), it is selling for a higher market price than PFD-B. And remember that PFD-A and PFD-B are both investment grade preferred stocks with the same rating and have 'cumulative' dividends (meaning that if the issuing company skips a dividend payment to you they still owe you the money). For those who own PFD-A, selling it and buying PFD-B boosts your dividend income by 0.30% and leaves $0.14 per share left over in your brokerage cash account, all while assuming no additional investment risk (as measured by Moody's). In a perfect market, this would never happen. Securities that pay a lower return would be selling for a lower price than higher paying alternatives of similar risk. But the market is not always perfect nor is it always fast, especially when there are large institutional investors involved as is the case with the marketplace for these high quality preferred stocks. Throw in a period of rapidly increasing market prices and bingo! - you have a market that favors individual investors who can react much more quickly to an imperfect market. Current market conditions are producing upgrade opportunities, providing preferred stock investors with an chance to trade in low payers for higher payers and have cash left over. There are five specific upgrade opportunities right now (March 30,2011), all involving widely held preferred stock issues. The table you see in Figure 3 was presented (with trading symbols) on page 3 of the April issue of CDx3 Research Notes, the monthly newsletter for CDx3 Notification Service subscribers. The technique used to perform an upgrade is always the same - sell the low payer and use the proceeds to buy the higher payer for a lower price. But the specific upgrade opportunity that you pursue depends on your individual investing goals. Looking at the last two columns in Figure 3 we can see that the dividend income gain varies for each alternative as does the cash gain. Preferred stock investors who favor maximizing their cash gain will find upgrade number 2 interesting since it not only results in a .125% dividend income gain but also leaves you with $0.50 per share left over in cash. Those looking to maximize their dividend income, however, would find upgrade number 5 attractive. While the cash gain is not as compelling as some of the other alternatives, your shares would take a 0.30% dividend income jump with upgrade number 5. While no one knows how long these conditions will last, your low payers are now trading for a respectable market price. So if you've been looking to unload a low payer or two, you should be paying attention right now. The Preferred Stock ListTM tool available to CDx3 Notification Service subscribers identifies upgrade candidates for you in a couple of mouse clicks. (Already a subscriber? For symbols see page 3 of the April 2011 issue of the subscriber's newsletter, CDx3 Research Notes). This month there are 7 preferred stocks offered by our Big Banks that provide a potential layer of principal protection not available with many other preferred stock issues. This table presents an updated list of Big Bank-issued trust preferred stocks (TRUPS) that will be among the first affected by section 171 of the Wall Street Reform and Consumer Protection Act, signed into law on Wednesday, July 21, 2010. (Already a subscriber? For symbols, check out page 7 of the current issue of the subscriber's newsletter, CDx3 Research Notes). AMB is a $6 billion real estate investment trust (REIT) founded in 1983 and headquartered in San Francisco. AMB acquires, owns and operates high tech logistics facilities located at major seaports, airports and other transportation hubs throughout the world. At the end of 2010, the company enjoyed 93.7% occupancy in its operating portfolio, leasing a record 37.7 million square feet to customers. 2011 has been a very busy year for AMB. In January the company announced that it would be merging with long-time rival ProLogis (PLD) in a staggering $14 billion deal. The deal is scheduled to be finalized this month with the combined company continuing operations as ProLogis. The seeds for this merger, although unknown to both parties at the time, were actually planted in September 2005 when ProLogis acquired Catellus Development Corporation for $5.3 billion. This deal went bad almost immediately for ProLogis and last month, about five years after the deal was struck, ProLogis sold off its Catellus assets for $505 million. This for a company that ProLogis paid $5.3 billion for five years earlier. ProLogis had saddled itself with a total of $8 billion in debt with little or nothing to show for it. AMB saw an opportunity and is now acquiring its primary competitor. Just as the dust was starting to settle on the ProLogis acquisition, a 9.0 earthquake and massive tsunami hit eastern Japan. In Japan, 90% of AMB's assets are located at seaports. As exposed as AMB's Japan properties were, their facilities managed to dodge most of the devastation which allowed the company to open its warehouse space as relief centers. Their 420,000 square foot building in Sendai was the hardest hit but after completing a structural review, the original $10 million damage estimate was lowered last week to $4 - $6 million. Another big focus has been the company's expansion in red hot Brazil. The growth of the country's consumer class has resulted in an increased need to transport products. In 2010 AMB launched the $434 million AMB Brazil Logistics Partners Fund which is funding development of logistics centers in Sao Paulo and Rio de Janeiro. Learn more about AMB Property Corp.: Company website | Profile | Upgrades/Downgrades | Recent News. What is meant by a preferred stock's 'liquidation preference'? 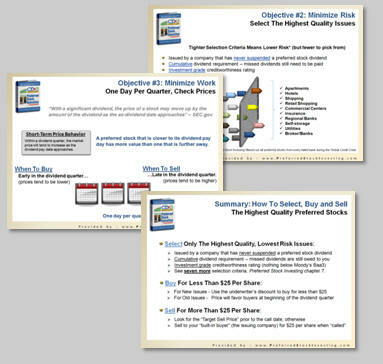 My book, Preferred Stock Investing, provides three specific rules - the Three Rules of Market Price Predictability - that influence the market price of a preferred stock. One rule is for the short-term of a dividend quarter; a second rule applies to the five year period between the security's introduction and its call date as interest rates fluctuate up and down; and the third rule describes market price behavior as the call date approaches. The single aspect of preferred stocks that allow all three rules to function as they do is that preferred stocks, unlike common stocks, have a "liquidation preference." Without knowing the liquidation preference, and knowing it in advance as preferred stock investors do, we would know as little about future preferred stock market price behavior as we do about common stock prices. While common stock prices move largely based on investor emotions (fear or elation) related to future profitability, preferred stock prices are much more influenced by their liquidation preference. It is the existence of the liquidation preference, and the market's reaction to it, that causes preferred stock prices to be relatively stable when compared to the volatility of the same company's common stock. The question this month for preferred stock investors: What is meant by a preferred stock's "liquidation preference?" The correct answer to this question is (A), the liquidation preference is the price per share that a shareholder receives in the event of a call. Generally, the liquidation preference of preferred stocks ranges from $25 to $1000 depending on which type of investor the issue is intended for. Preferred stocks with a $25 liquidation preference are aimed at individual investors while issues with a $50 or $100 liquidation preference are positioned to attract institutional investors. The liquidation preference of the TARP preferred stocks that banks issued to the U.S. Treasury was $1,000 per share. The liquidation preference of a preferred stock is declared within the prospectus on file with the SEC as is the call date of the security. Once the call date arrives, the issuing company regains the right to purchase your shares back from you. In the event that they choose to do so they are obligated to pay you an amount equal to the published liquidation preference for each share that you own. For this reason, the market price of a preferred stock starts to trend toward its liquidation preference as the call date approaches if the market believes that conditions favor a call. This is the Rule of Call Date Gravity from Preferred Stock Investing (page 59). Individual investors typically purchase preferred stocks that have a $25 liquidation preference. In the event of a call, $25.00 per share will show up in your brokerage cash account and your shares will no longer appear in your holdings. It is for this reasons that preferred stock investors who are following the preferred stock investing method described throughout Preferred Stock Investing always purchase their shares for less than $25.00 each. Purchasing your shares for less than the liquidation preference provides two benefits to investors: (1) you add a layer of principal protection to your investment and (2) you position yourself for a capital gain in the event of a call. As itemized in chapter 15 of Preferred Stock Investing, adding on a capital gain to the great dividend income that the highest quality preferred stocks earn generally pushes your Effective Annual Return over 10 percent. To retire ("call") an old preferred stock a company needs a certain amount of cash since they are going to need to purchase the shares held by current shareholders. To generate that cash, they will usually sell a new preferred stock that offers a lower rate than the preferred stock being called. This is similar to refinancing a mortgage and is done for all of the same reasons - primarily to save dividend expense. Since preferred stocks generally carry a five year call date (that is, the company regains the right to call your shares five years after the issue is introduced to the marketplace), we will generally see calls pick up if today's interest rates are lower than they were five years ago. Under those conditions, a company can issue a new preferred stock at today's relatively low rate and use the proceeds to buy your older, higher dividend payer back from you (at $25.00 per share). This chart, called the CDx3 Key Rate Chart, shows the "cost of money" at three levels within the U.S. economy: the dividend rate that the newest high quality preferred stocks offer (top line) compared to the yield on the five year treasury note (middle line) and the federal funds rate (bottom line). 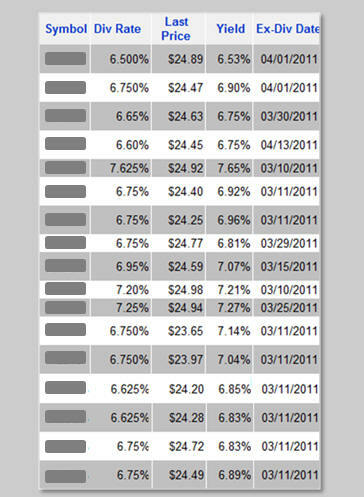 As shown on the chart, high quality preferred stock dividend rates were the same five years ago as they are today. Since there are no savings to be had by calling a five year old issue, there are relatively few calls happening in today's preferred stock marketplace. With the threat of a call removed, the number of great choices available to preferred stock investors has been growing since the market is making no distinction between issues that are beyond their call dates and newer issues that have yet to reach their call dates. The Preferred Stock ListTM tool on the CDx3 Notification Service website produced the list of 17 high quality preferred stocks that you see here. These issues have all exceeded their call dates, but since the market does not believe that current conditions favor calls, the market prices and yields of these issues are no different than similar high quality preferred stocks that have yet to reach their call dates. Each of the 17 preferred stocks seen in this table (1) is rated investment grade, (2) have 'cumulative' dividends, (3) are issued by a company that has never suspended a preferred stock dividend, (4) is currently available for less than $25.00 per share (see the above CDx3 Question of the Month article regarding why this is important) and (5) is in the early days of a new dividend quarter when the market price tends to favor buyers (i.e. they have just cleared their respective ex-dividend dates). Until market conditions favor calls (i.e. today's interest rates fall below those of five years earlier), preferred stock buyers are being treated to a buffet of excellent choices. How long is it going to last? 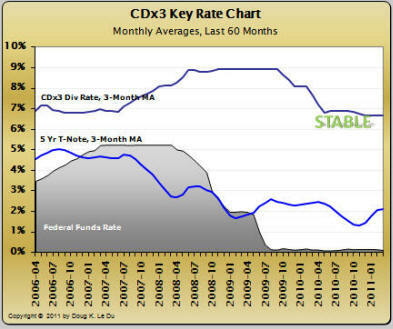 Take a look at the CDx3 Key Rate Chart again. High quality preferred stock dividend rates started increasing in June 2007 when rates jumped from 7% to 9% within twelve months. That means that in June 2012 the first of the preferred stocks issued back then will start to become callable. Until at least then, market conditions are unlikely to favor many calls since today's interest rates would have to fall further before it would pay company's to do so. The federal funds rate, currently at zero, drives the cost of money throughout the economy. Not many analysts are thinking that interest rates are about to go down. But that is what it would take for preferred stock dividend rates to fall below the 7% offered by issues from five years ago. The next milestone will most likely not occur until June 2012 when the first crisis-era preferred stocks, issued in June 2007, start to become callable. Until then, preferred stock buyers have an unusually large inventory of high quality preferred stocks from which to pick.